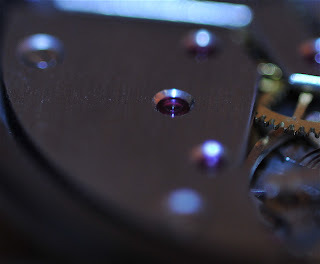 One of the things I am trying to find out is the different types of finish or decorations that is found on the watch movement. This is basically what I found out. We start with Vrac. 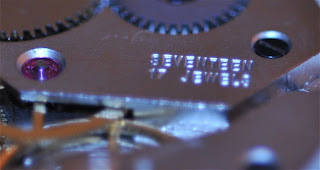 This is the electroplating of the movement to provide some form of protection rather as a finish or decoration. The movement is plated with either nickel (cheapest), gold (gilt?) and Rhodium (most expensive). Flat matte finish: As the name implies, this finish is matte and looks unfinished. This is the most basic of finish available. Flat Brush Finish: this finish is achieved by brushing the finish is a single direction. I am not sure if this is the same as Adoucie. Adoucie: this is a form of polishing that is either linear or circular. It is achieved with the use of abrasive paper. Colimaçonnée: also known as Colimaçon (snalling or spiralling). Snalling is a decorative finish which takes the form of curved lines orginating from a common center, much like a snail's shell. Colimaçonnée diamant: this is the same as Colimaçonnée. This is achieved with the use of a rotating diamond cutting tool which imparts brilliance on the cut surface. Colimaçonnée papier: another form of snalling but with the use of abrasive paper. Also known as Soleil (sun) or Soleillées (sun beams). This this achieved by rotating the abrasive paper on the rotating parts to be polished. The strokes can originate from a common center or be at a tangent to the edge. Perlée: also known more commonly as Perlage (machine turned). This is the most common form of decoration. It looks like swirls of overlapping circles. The circular grains are achieved by applying overlapping circular patterns by rubbing a pegwood with emery paste. Côtes de Genève: also known as Geneva Bars, Geneva Stripes, Glashutte Ribbing (Genfer Streifen/ Glashutte Streifen). This decoration is often linked to high end movement. The angular striped finish is made up of a succession of parallel lines at fixed intervals (waves), but in opposite direction to each other. This finish is created by using an abrasive grinding stone or boxwood pad and lathe. It is also known as Damaskeering. Côtes Circulares: also known as Fausses Côtes (circular stripes/ bent stripes). This is the same as Côtes de Genève but instead of bars or stripes, it is concentric circles.